One Of Herman Cain's Initial Accusers Is Identified : It's All Politics Another name of a woman accusing Herman Cain of sexual harassment has surfaced. A lawyer for Karen Kraushaar previously gave an anonymous account of her complaint against Cain. Cain accuser and longtime government employee Karen Kraushaar once worked as a spokesperson for the Immigration And Naturalization. 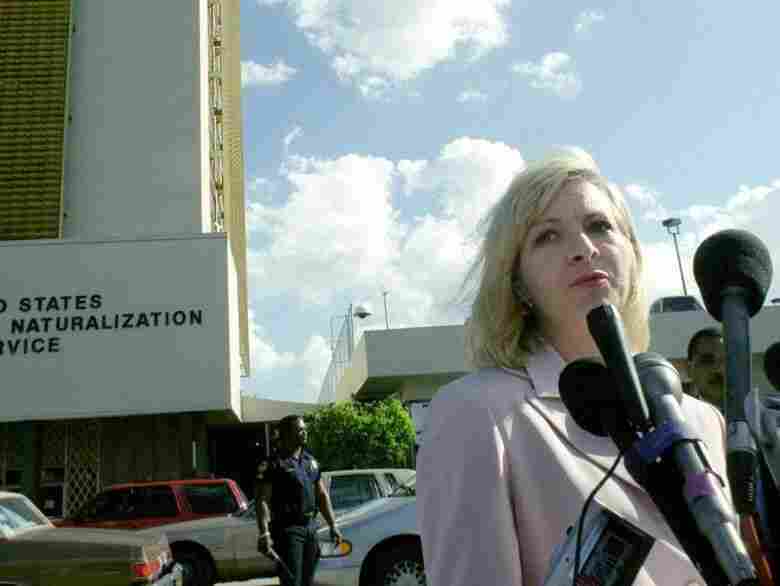 She offered a statement after meeting with the Miami family of Elian Gonzalez in March of 2000. Until now, Karen Kraushaar has been known to many in Washington as "Woman A," one of two employees who settled claims of sexual harassment against Herman Cain more than a decade ago when he headed the National Restaurant Association. On Tuesday, after another woman went public with her harassment accusation against Cain, Kraushaar's identity was revealed by an iPad news site, The Daily. Kraushaar has confirmed to NPR that she is one of the first two women, but declined to say more about the incident, beyond an anonymous statement her lawyer issued last week. Kraushaar, 55, a career federal employee and registered Republican who characterizes herself as an independent, currently works as a communications director at the U.S. Treasury Department. The release of her name also came after the restaurant association, acting on a request by Kraushaar's lawyer, Joel Bennett, freed her last week from a confidentiality agreement signed when she settled her harassment case against Cain and left the association with a cash payment in June 1999. Bennett on Friday read a statement on behalf of Kraushaar, who alleged the incidents involving Cain were "a series of inappropriate behaviors and unwanted advances from the CEO." Bennett on Tuesday offered no further comment, but said he and Kraushaar "stand by the statement issued last Friday." Cain, 65, left the association in 1999 and became a co-chairman of Republican Steve Forbes' short-lived presidential campaign. He is scheduled to hold a 5 p.m. ET press conference Tuesday to address harassment accusations against him. Kraushaar, who has an undergraduate degree from Brown University and a master's degree from the University of Michigan, served as the association's media director during part of Cain's tenure there. She has resisted having her name or her story become part of an increasingly grubby narrative that threatens to badly damage, if not end, the candidate's quest for the Republican presidential nomination. The complaint details would have remained sealed as part of the confidential settlement with the association that she signed 12 years ago. But Cain, former head of Godfather's Pizza, is now a front-runner for his party's nomination, and that changes things. As Cain has ascended, so has scrutiny of his past, including his post-Godfather's stewardship of the Washington-based restaurant group from 1996 to 1999. Despite Cain's improbable rise to the top of the GOP field, Kraushaar and the second woman had shown no interest in revealing their experience at the association. A third woman, who also declined to reveal her identity, last week told the Associated Press that Cain allegedly harassed her while she worked at the association, but she did not file a complaint. A fourth woman came forward Monday. Sharon Bialek, a former employee with the association's Chicago-based education arm, claimed that 14 years ago Cain groped her when she met with him in Washington to seek help finding a job. An Oct. 30 story in Politico that revealed the existence of the complaints by Kraushaar and another woman, and their settlements, started the firestorm around Cain. He has given evolving accounts about his knowledge of the complaints and settlements, but has steadfastly characterized the woman's allegations as false. Cain has described the situations in question as benign. He has suggested that the women who complained about his behavior didn't understand his brand of humor, and, at one point, his campaign accused presidential opponent Rick Perry's campaign of being behind the leak of the more than decade-old allegations. People who had direct knowledge of the case against Cain at the time have told NPR that the harassment was persistent, usually but not exclusively verbal, and involving sexually graphic comments and approaches when the women were alone with him in work situations. Those same sources also say that the two women independently pursued their complaints, unaware of the other's claim. The second woman, a recent college graduate when she worked at the association, signed a similar agreement that paid her a year's salary of $35,000, according to the New York Times. She now works at a New Jersey lobbying firm. At least one of the women reported her allegations to a supervisor, who passed it on to the organization's human resources department, but the alleged behavior by Cain did not stop, NPR's sources say. Kraushaar and her husband of 26 years, Kevin Kraushaar, live in suburban Maryland. A lawyer, Kevin Kraushaar works as a lobbyist, and is also registered Republican. Before her long career in professional government jobs, Kraushaar, an accomplished equestrian, was a news reporter and editor. She also has written a true story children's book with her mother-in-law, who lives in Michigan. In her job at the Treasury Department, Kraushaar currently serves as a communications director for the department's inspector general for tax administration. Her brief employment with the restaurant association was her first, and only, experience working with a private lobbying organization. When she left the restaurant association, Kraushaar initially returned to her former job as a senior communications analyst at the Taxpayer Advocate Service before accepting the job at the Treasury Department. She has also worked as a public affairs specialist at the Department of Homeland Security, the Justice Department, and the Consumer Product Safety Commission. At a press conference Tuesday afternoon, Cain emphatically denied past sexual harassment allegations lodged against him by four women whose claims have come to light over the past week. When asked specifically about Karen Kraushaar, who settled harassment claims against Cain 12 years ago when he headed the National Restaurant Association, he said he recalled only one incident. Cain then repeated a story he has told since the harassment allegations came to light. Kraushaar, the association's media director at the time, was in his office, Cain said, and he gestured to indicate she was the same height as his wife. His office door was open, and his secretary was there, Cain said, adding: "End of story." Cain said that Kraushaar's complaints were found to be "baseless," though he did not indicate who made that finding. He claims that she was paid to settle her complaint as part of a "personal separation agreement." Kraushaar, through her attorney, has described the harassment as "a series of inappropriate behaviors and unwanted advances from the CEO." Her attorney, Joel Bennett, has already taken issue with Cain's characterization of the settlement Kraushaar got. "This was a settlement of an internal complaint of sexual harassment," he said last week. Since her identity was revealed Tuesday, Kraushaar, a career federal civil servant, has spoken to several news organizations. She's suggested that she and the three other women who have accused Cain of harassment — including Sharon Bialek, who went public yesterday — hold a joint press conference to make their case.